lsaari14 | Social Media & Beyond! Do you know anyone not using social media? Five to ten years ago, most people could say yes, but today the answer is generally no. Or if they do know someone not using it, it’s just one or two people at the most. It’s remarkable to think how far communication has come in just the past few years. We have new social media sites, mobile capabilities seem endless, and consumers are staying connected with companies in ways unheard of just five years ago. Social media itself has come a long way, but so have companies who utilize social media in their marketing strategies. Future implications for social media marketing include: real time, customer-centric, mobile usage, searching, and tracking data. To start with, consumers are finding out about news and events almost instantaneously through social media. When the blackout occurred at the last Super Bowl, I just happened to be away from the TV and when I came back I noticed the stadium was black, so I immediately went to Facebook to find out what happened. We’re in an age where people want answers immediately and want to be able to interact and be part of live events. Companies are beginning to use innovate and creative tactics to reach consumers with live brand social experiences such as flash mobs and live promotions. A study in the UK found that 37% of consumers would join a brand’s social media page as a result of a live brand social and 49% are more positive about brands that do so (Taylor, 2013). Social media needs to be all about the consumer. After all, without them social media would not exist. Companies need to get in the habit of thinking of their social media audience as potential future customers or referrers of future customers (Leaning, 2013). Smart phones and apps are becoming an everyday norm with more than 50% of U.S. mobile phone users now smart phone users (McDernott, 2013). Companies now need to think about consumers that can access social media and websites through their phones or other mobile devices. Content needs to be altered to fit small screens and low capabilities. Apps can be designed to bring more engagement and interaction between the consumers and brand. Social searching is becoming a trend as well. Companies need to include keywords throughout their social media site in which consumers might use when searching for the company or product. In fact Facebook just recently announced they will now make hashtags clickable and searchable (McGarry, 2013). How can a company really know if their social media strategy is successful? Fortunately today companies have many options available to track their data. This includes sites like Google Analytics, HootSuite, etc. All of these sites track and analyze various aspects including, likes, comments, click through rates, how many views, etc. This type of data can really help companies today in that while comparing it to sales figures, it can show whether social media is having an impact on sales or just brand awareness. Companies can also tailor their strategies depending on the results. If they notice certain features are not getting any likes or comments, companies can try something else to generate more engagement. Companies can also find out what consumers are saying about a brand or product by searching social media sites. One tool this can be done on is Social Mention. Want to know what social media platforms are being used the most by companies? Here’s a list of the top ten marketers plan use in 2013. Social media is a part of our everyday life and companies are now aware of this fact as well and are able to communicate and engage with consumers in a variety of ways. It’s been interesting to see how far social media has come within the past few years, and it’s hard to believe what they’ll come up with next. Leaning, B. (2013 March 13). The future of social media marketing according to HubSpot’s CMO. Retrieved from: http://blog.hubspot.com/blog/tabid/6307/bid/34257/The-Future-of-Social-Media-Marketing-According-to-HubSpot-s-CMO.aspx. McDernott, J. (2013 May 28). A majority of U.S. mobile users are now smart phone users. Retrieved from: http://adage.com/article/digital/a-majority-u-s-mobile-users-smartphone-users/241717/. Taylor, J. (2013 May 22). Are live experiences the future of social media marketing? Retrieved from: http://oursocialtimes.com/are-live-experiences-the-future-of-social-media-marketing/. As several experts in the marketing field, including Jonah Berger, say going viral is not about luck or chance, instead there’s a science behind it (Schawbel, 2013). What makes a marketing initiative go viral? The content itself is what will help drive the whole ad into the social world. It must be able to spark interest in consumers and there needs to be a target market in mind as well. If the target market doesn’t get the message or doesn’t care, odds are it will not go viral. The ad needs to be relevant to consumers. It can either relate to current events, time of the year, trends, etc. Emotion is very important in making content go viral as it drives consumers to share it with their friends. This can be humor, sadness, anger, etc, but it really does depend. Negative emotions like sadness decrease sharing, but it’s not so much about the positive or negative than it is about arousal – in what feelings it evokes in consumers to pass things on (Nicholson, 2013). There are countless viral ads that depict examples of evoking emotions in consumers and the one I picked is with the Jeff Gordon prank by Pepsi MAX. In this video, Jeff Gordon is disguised while taking a car for a test drive with a salesman. Now because Jeff Gordon is a professional racer, he drives the car very wild while the salesman is freaking out inside. The idea of this ad was to present how Pepsi MAX is a zero-calorie drink in disguise as well. Click here to watch the video. This ad provoked a lot of humor in consumers, which helped it go viral. Pepsi utilized hash tag to help spread this video by including #GordonTestDrive in the description on You Tube (Pepsi, 2013). Another good aspect is interactivity. Consumers will get more out of content if they can interact in some way, whether that’s clicking on a link or commenting. Interactivity helps consumers connect more with the company or brand. It allows them to feel like they can contribute in some way if the interaction involves commenting for example. A good example for this is one of the first examples in viral marketing, Hotmail. When Hotmail users would send out an email, the bottom of every email contained a message stating “get your free email at Hotmail”, where users could click on that link and they were taken to Hotmail to either sign up or find out more information (Bianchi, 2012). This is a great example of interaction as users could click on a link in which they were taken to then be signed up with the company and be more involved with the brand. Social currency is actually a good idea Jonah Berger had in his research, which is “the idea that people share things that make them look good” (Schawbel, 2013). So users can share information that will make them seem like they are smart or up on the latest trends. An example of social currency is with the Dove Real Beauty video. This ad features women coming in to describe themselves to an artist, of which many women pick out their negative facial features. Before doing so these women first met another woman involved in the ad and they were asked to describe her as well, which many women described their positive features. The women were then shown both sketches (the one they described and the one described by another woman). The one described by another person was much closer to the real than how the women described themselves. The overall message Dove portrayed with this ad is the idea that “you are more beautiful than you think” (Gray, 2013). This ad can help others feel good about themselves and want to spread that same message to their friends as well. Dove also helped make this ad more social by tagging it with their whole Real Beauty campaign and using a hash tag to help in the conversation (DoveUnitedStates, 2013). There are several aspects that can help a campaign go viral including the overall content, the relativity, emotion, interaction, and social currency. All of these and many other factors are what contribute into consumers seeing these videos on a daily basis and hearing about news reports about the latest video that went viral. We live in a social world that just wants to keep sharing and companies will keep taking advantage of that! Bianchi, L. (2012 August 7). How Hotmail became a viral hit once. Retrieved from: http://www.viralblog.com/research-cases/how-hotmail-became-a-viral-hit-once/. DoveUnitedStates. (2013 April 14). Dove real beauty sketches [Video file]. Retrieved from: http://www.youtube.com/watch?v=XpaOjMXyJGk. Gray, E. (2013 April 16). Dove’s ‘real beauty sketches’ ad campaign tell women ‘you’re more beautiful than you think’ (video). Retrieved from: http://www.huffingtonpost.com/2013/04/15/doves-real-beauty-sketches-ad-campaign-video_n_3088071.html. Nicholson, C. (2013 May 17). Q&A: Jonah Berger, Wharton marketing guru, on what makes things go viral. Retrieved from: http://www.smartplanet.com/blog/pure-genius/q-a-jonah-berger-wharton-marketing-guru-on-what-makes-things-go-viral/10010. Pepsi. (2013 March 12). Pepsi MAX & Jeff Gordon present: “Test drive” [Video file]. Retrieved from: http://www.youtube.com/watch?v=Q5mHPo2yDG8. Schawbel, D. (2013 April 25). Jonah Berger: How to make your marketing campaign go viral. Forbes. Retrieved from: http://www.forbes.com/sites/danschawbel/2013/04/25/jonah-berger-how-to-make-your-marketing-campaigns-go-viral/. I have chosen to examine two giants in the consumer beverage industry, Pepsi and Coca Cola, and how these two companies utilize social media. Pepsi is active on Facebook, Twitter, and You Tube. There idea is to build relationships with millennials, ages 18 to 35, which just happens to be the “largest, most diverse, educated and complicated group of shoppers the world has ever seen” and they are the most active on social media sites (HootSuite, 2013, para. 3). This is exactly why Pepsi is after this generation. “Pepsi is learning that if you want to remain relevant with this new type of consumer, you have to be where they are, you have to talk their language, and you have to connect with them in a way that keeps them feeling like they want to be part of your brand” (Horton, 2012, para. 5). After all that is the idea of engagement marketing. Companies need to keep their consumers interested in the brand by reaching out using social media tactics and making consumers think differently about the brand because of their engagement on social media. One of Pepsi’s new global campaign is called Live For Now in which inspires consumers or Pepsi fans to live for the moment and live life to its fullest with the idea of connecting on a global level with consumers (PepsiCo, 2012). The U.S. version, Pepsi Pulse, features interacting content with videos of music stars, Pepsi ads, tweets from fans, pictures of Pepsi products taken by fans. Their website engages consumers by highlighting aspects of how they “live for now”. Their Facebook and Twitter pages contain the same type of content by highlighting “live for now”, featuring Pepsi drinks being utilized in different ways, pop culture icons, and thousands of comments from fans. Their You Tube account features videos of their ads and highlights of the “live for now” campaign. What’s so important for any company and what Pepsi is doing very well is keeping their brand image consistent. Every site is all about the “live for now” campaign. Pepsi is utilizing an integrated marketing communications strategy. What’s also important is that Pepsi is simply letting consumers speak, but they are also communicating back by reviewing what consumers say about the brand and answering questions or trying to solve problems. Coca Cola on the other hand is active on Facebook, Twitter, You Tube, LinkedIn, Google+, and Flickr. Coca Cola ranks as the most valuable brand in the world and the most followed on Facebook (Roman, 2013). That kind of ranking is a lot of pressure for a brand as they need to uphold their image throughout social media. One of the keys aspects Coca Cola does throughout their social media sites is they listen to consumers and then respond. Their SVP of Integrated Marketing states “we have to, consumers expect that we’re listening and responding” (Roman, 2013, para. 6). They also make sure everything they do and are is share worthy. That is a strategy seen throughout their social media sites. Their Facebook page contains stories and pictures from consumers about what Coke means to them, various pictures depicting Coca Cola, and comments from consumers. Their Twitter and Google+ contains news about the Coca Cola Company. Their You Tube account features different ads they have run, their products in the news, and consumers using Coke all around the world. Flickr features photos submitted by users and also ads the company has put out. Coca Cola wants fans to talk about them and have that lead to sales. However a recent study from Coca Cola indicated that their social media does little to influence sales (Clark, 2013). Wendy Clark, SVP of Integrated Marketing says the study is true, but yet still says social media can do much more and is in fact a combination of media that helps brands. “It’s the combination of owned, earned, shared and paid media connections – with social playing a crucial role at the heart of our activations – that creates marketplace impact, consumer engagement, brand love and brand value” (Clark, 2013, para. 6). Overall these two brands have a tremendous impact on consumers as they engage throughout social media. They are well known brands and have to keep up their image wherever that engagement may take place. Clark, W. (2013 March 20). Coca-Cola’s Wendy Clark defends ‘crucial’ social media. Retrieved from: http://adage.com/article/cmo-strategy/social-media-matter-marketing-coca-cola/240444/. HootSuite. (2013 January 11). The evolving role of brands for the millennial generation. Retrieved from: http://blog.hootsuite.com/the-evolving-role-of-brands-for-the-millennial-generation/. Horton, C. (2012 May 17). 5 ways Pepsi’s use of social media is right on. Retrieved from: http://socialmediatoday.com/synecoretech/509355/5-ways-pepsis-use-social-media-right. PepsiCo. (2012 April 30). Pepsi launches first global campaign, “live for now”. Retrieved from: http://www.pepsico.com/pressrelease/pepsi-launches-first-global-campaign-live-for-now04302012.html. Roman, E. (2013 January 24). Coke’s 7 smart social media rules for success. Retrieved from: http://www.huffingtonpost.com/ernan-roman/cokes-7-smart-social-medi_b_2528038.html. In this blog we are suppose to discuss how we see social media evolving. It’s hard to say what may happen because as technology shows us, things change in an instant, and we have to adapt to those changes. So what is the future of social media? Social media seems to be everywhere these days. And as the author of Groundswell, Charlene Li, talks about how it will be embedded in every activity: “Transactions will be constantly rated and reviewed. Tags, supplied by ordinary people, will reorganize the way we find things. Feeds will alert us to any changed content, and feed readers will be as much a part of the online experience as email or browsers are now” (Li & Bernoff, p. 235). “The integration of credible and relevant social media…will be viewed as strategy, rather than tactic. Because if brands are not fully embracing social in all its forms, you will have missed the bullet train and you probably won’t be able to get back on”. “Companies will need to create one universal social strategy for multiple platforms that will serve a core marketing purpose”. “Brands will learn how to put the personal before the profit, and in turn will actually generate a profit via social media. Social media will facilitate the expansion of word of mouth marketing, as people will see recommendations from their friends and family right where they are looking to make a purchase”. “Many advertisers will be looking for more ‘grown up’ ways to participate in social media. Either social media websites like Twitter will break off to create more grown up ways of participating or new sites will pop up like LinkedIn but with a more Twitter or Facebook-like feel”. Obviously there are several viewpoints to this subject. So much information is being collected from users where we see, for example targeted ads. Well one way social media could be going is that “we will no longer need to search for information on the web as information will find us based on all this data which companies are collecting” (Noff, 2011). So based off of our likes, dislikes, interests, etc, information will be brought to us instead of searching for it, which will save a lot of time and energy. Relationships and communication is changing as well as it is easier now more than ever to have a relationship with someone half way around the world. Relationships today don’t always mean face to face. You can have a lifelong pen pal, online only! “We will befriend and hang out with people from all over the world and all walks of life, all ethnicities and all beliefs, creating a worldwide melting pot” (Noff, 2011). This will help in understanding each other’s beliefs, cultures, languages, etc. Social media connects everyone in the world. Businesses can change the way they view social media and customers as well. They will hopefully begin to “realize that social media is not about the number of people brands have in their communities, but rather the amount of engagement that they see on their page and the overall sentiment they faced this month as opposed to the last” (Noff, 2011). One thing I hear people saying is that social media is just a fad and it will die out at some point like all fads do. A while ago I remember reading an article in which someone stated that this is just the beginning of social media; we still have a long way to go until this “fad” dies out. Do you think social media is just a fad that will die out one day? There have been so many changes in social media since I first joined MySpace (I believe 7 or 8 years ago). It certainly has come a long way and we still see so many new and different social media tools added on a regular basis. It will be interesting to see what happens with social media. Where do you see social media going? Li, C. & Bernoff, J. (2008). Groundswell: Winning in a world transformed by social technologies. Forrester Research. General Mills has world-renowned brands including Betty Crocker, Cheerios, Gold Medal, Haagen-Dazs, Pillsbury, Totino’s, Yoplait, and much more. Their brands include ready-to-eat cereal, refrigerated yogurt, frozen vegetables, Mexican aisle products, grain snacks, ready-to-serve soup, dry packaged dinners, refrigerated dough, dessert mixes, frozen hot snacks, and fruit snacks. Each of those ranking number one or two in the US Retail market (General Mills Inc., 2011). With world-renowned brands however, General Mills must live up to the standards of quality all consumers expect of the brands. That now includes communicating to consumers through social media. It was difficult to find an exact list of what type of social media sites General Mills uses, but from my research, I found they use Twitter, YouTube, LinkedIn, Flickr, and a General Mills blog. Twitter included thanking people involved in events and for support, as well as post on food trends and staying healthy. YouTube includes interviews and videos promoting products such as Wheaties. LinkedIn is used for networking with business professionals at General Mills. Flickr includes pictures of new designs for their products, events and promotions where General Mills was a sponsor. General Mills blog includes nutrition and health trends, events, company innovations, information about the company, and much more. As with any company, switching to social media and having to think about marketing on there is always a struggle, but the important thing is to have a presence online where consumers can communicate easily and efficiently with a company. Last year, Mark Addicks, Chief Marketing Officer for General Mills, sat down for an interview with Minnesota Public Radio and spoke about social media marketing. Here is what he had to say: “And so one of the things that you really need to do is let go and really encourage your marketers and your teams to go out, it’s a social atmosphere, and experiment. Learn quickly. The great thing is, they can now raise their hand. They can give you really instant feedback. They can volunteer and help you, which they couldn’t before” (Hobson, 2011). “One way General Mills gets the conversation going is by saying to consumers, here’s why we created this product, here’s how we think it works, tell us what you think. Feedback can be in different forms, including video, and the ensuing dialogue provides rich insights for the product developers and food experts” (The Social Media Soapbox, 2009). “To help track what consumers say about its products on social media websites and blogs”, General Mills hired an Atlanta, Georgia based company, Sentiment360 (Beasley, 2010). They look at what the trend is, how they’re doing against the broader competitions, and even how they’re doing with the category. They try to find answers by looking through social media sites. They even introduced a product, Fiber One Bars, specifically through social media without any advertising in traditional media and it was a success. The success of which was measured through sales. “And what was beautiful about this was that there really wasn’t anything else and we could actually track the daily sales to some of the postings that people had done” (Hobson, 2011). 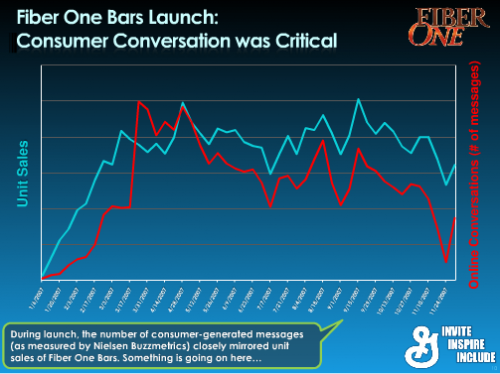 There was in fact, a nearly exact correlation between online postings and sales of Fiber One Bars. The chart below shows this. “It’s the kind of chart you can take to management to prove the value of consumer participation in the development and launch of products through social media tools” (The Social Media Soapbox, 2009). In today’s world, it seems that you must have a presence online, but also use social media tools appropriately by communicating with consumers. And in turn, you must be able to measure and track social media sites in able to measure the success of social media marketing. It seems as if General Mills has a pretty good thing going for them when it comes to social media. They not only have world-renowned products, but they’re also gaining success by being online. What kind of social media presence have you noticed from General Mills? Do their presence online make a difference for you when choosing brands? Beasley, D. (2010, June 14). General Mills hires Atlanta company for social media research. Retrieved from http://www.globalatlanta.com/article/23997/. General Mills Inc. (2011). Annual report 2011. Retrieved from http://generalmills.com/~/media/Files/2011_annual_report. Hobson, J. (2011). General Mills Chief Marketing Officer Mark Addicks on how marketing can make a better world [Radio series episode]. In Bright ideas: Fresh thoughts on big issues. Minnesota Public Radio. Retrieved from http://minnesota.publicradio.org/display/web/2011/01/20/bright-ideas-with-mark-addicks–. The Social Media Soapbox. (2009, October 25). General Mills goes social [Web log post]. Retrieved from http://socialmediasoapbox.wordpress.com/2009/10/25/general-mills-goes-social/. What’s All The Buzz About QR Codes? So what’s the buzz all about QR Codes? Here you’ll find out what they are and the best ways to use them for any business. So now you have a QR code for your business, but how do you go about implementing it into your marketing campaign? QR codes can be placed almost anywhere: packaging, ads, posters, billboards, business cards, stickers, and your website. In New York City, they are seen “on bus shelters, phone kiosks, drug store signage, cocktail napkins and sporting venues” (Donnelly, 2010). Wherever you want someone to see your product, service, or business name, place the code there to generate business. Know where your target market is and place QR codes there. Many people probably still don’t know how to use a QR code so informing them will be helpful as well. Simply put the steps next to the code to tell users what to do and how to access the information. Where have you seen QR codes being used? Another tip to remember is that this information has to fit and look good on a small phone screen. Keep videos short to hold the consumer’s interest. The possibilities for QR codes are endless, but it may help researching them and your audience to make sure it’s a fit for your company. In order to tell the whole story behind a product or service, consumers need a supplement to what they see in an ad, billboard, etc, and QR codes can help with that. “QR codes can provide additional information, including photos, reviews, directions and event date and times. There’s a certain amount of fun and surprise with QR codes” (Brooks, 2011). Do you scan QR codes? Where have you seen them? Share where and how you’ve used QR codes. Brooks, R. (2011, January 24). 13 creative ways to use QR codes for marketing [Web log post]. Retrieved from http://www.fastcompany.com/1720193/13-creative-ways-to-use-qr-codes-for-marketing. Donnely, T. (2010, December 16). How to use QR codes to market your business. Inc. Retrieved from http://www.inc.com/guides/2010/12/how-to-use-qr-codes-to-market-your-business.html. Social media is everywhere…as most of us know! One area where you may not expect to see it and hear professionals using it is in education, every institution from K-12 through colleges. Of course without social media and the study of it, the class I’m taking now would not be possible! When I graduated from high school five years, social media was just starting to be “popular” so many of my teachers and classmates were either just starting to use it or didn’t know what it was yet. But things have changed a lot in the past five years, so just how is social media used in education today? Of course, social media isn’t just used in higher education, K-12 educators are using as well. According to a survey, 61% of educators in K-12 reported they had joined a social network (Software & Information Industry Association, 2011). The survey also reported the main purposes of those schools using social media were to build brand awareness, increase the loyalty of customers, general knowledge, and to create support groups. In fact, “Facebook has made serious efforts to try and ensure they reach out to parents and the education community, addressing concerns regarding the use of the platform by children and teens. They have created a resource for teachers that answers some common questions such as what to do if you suspect abusive behavior on Facebook, how to hide your personal Facebook profile from yours students and how to report underage users” (Peyton, 2011). Do you think K-12 educators should be “friends” or “follow” their students on social networks? I work for a school district’s community education department and we manage the district’s Facebook and Twitter accounts. We primarily use it as an announcement factor where we update users of events or important information for parents and students. Some school districts even have a blog by the superintendent. How have you seen K-12 social media being used? What do you think are the benefits of it for those age ranges and their parents? Peyton, L. (2011, Septemeber 14). Breaking down top Facebook pages for the education industry. Retrieved from http://socialfresh.com/facebook-pages-education/. Shah, S. (2011). How social media is changing the education industry. Retrieved from http://www.penn-olson.com/2011/04/10/social-media-education-infographic/. Software & Information Industry Association. (2011, June 8). Survey: Social media rising in education industry. Retrieved from http://www.techlearning.com/article/51300.